t could simply be a coincidence. Or perhaps the decision to exhibit Edvard Munch’s most famous work, The Scream, at the British Museum in April, closely following Britain’s scheduled 29 March exit from the EU, is an artful piece of deliberate subversion. Either way, the Norwegian painter’s celebrated depiction of extreme pain occasioned by high anxiety, mental instability, grief, loneliness and separation seems especially well-suited to the times. Yet while Britain heads for a potentially spectacular nervous breakdown, an agitated Europe is not in much better shape. Nervousness abounds about the EU’s prospects and cohesion, with the focus on European parliament elections on 23-26 May. This normally dull, uninspiring contest is turning into a battlefield on which a definitive struggle over Europe’s direction may be fought and decided. The last elections in 2014 saw the lowest ever turnout; 2019 could be very different. Two rival camps are emerging and one is doomed to defeat. On one side stand France and Germany, the fabled motor that notionally powered the EU from its inception. Emmanuel Macron, France’s president, hopes voters will endorse his vision of a more integrated Europe, economically, financially and politically. Angela Merkel, Germany’s chancellor, is cautious about the specifics but supports Macron’s thrust. Both want an EU that can better stand up for its interests and values in a world shaken by the iconoclasm of Donald Trump. In her new year address, Merkel said Germany would take greater responsibility for seeking “global solutions” to global problems such as terrorism, migration and climate change. Her remarks were seen as defiance of both Trump’s nationalistic “America First” agenda and the 2016-18 rightwing populist advance in swaths of Germany and across Europe. Merkel and Macron will sign a highly symbolic update of the landmark 1963 Franco-German friendship treaty in the border city of Aachen this month. They aim to accelerate cooperation in defence, security and diplomacy, notably at the UN security council, where Germany is starting a two-year stint. Their message is plain: whatever Trump may say, multilateralism and the collaborative postwar world order remain alive and kicking – and henceforth their ideological home will be in the heart of Europe. Problems with this approach are many. 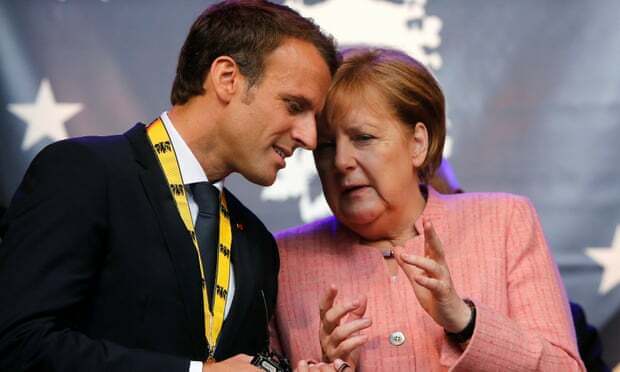 For a start, much of what will be agreed in Aachen amounts to a sop to Macron, whose more ambitious ideas about budgetary and eurozone integration find scant support in Berlin. Then there is the growing weakness of both leaders. After a string of state election reverses, Merkel said she would stand down no later than 2021. Macron is under siege at home from gilets jaunes demonstrations – increasingly hijacked by the far right – objecting to everything from the cost of living to his Sun King airs. Long-time EU watchers see the Aachen exercise as a broad restatement of long-established, essentially nebulous goals that nevertheless reflect a resurgent geopolitical reality: that with Britain out of the mix, Paris and Berlin are re-establishing the virtually unchecked European hegemony they enjoyed before Edward Heath and Margaret Thatcher butted in after 1973. In short, the dominant Franco-German axis is back, or could be – bad news for abandoned UK allies in central and eastern Europe. A more fundamental problem with these machinations is Europe’s admirably unbiddable voters, which brings us back to the May elections. Last week saw the most unabashed expression yet of the determination of Europe’s disparate, predominantly rightwing populist, nationalist, anti-immigrant and xenophobic parties to join together to break Brussels’s sclerotic, self-serving grip. Speaking in Warsaw after meeting senior members of Poland’s conservative government, Matteo Salvini, Italy’s deputy prime minister and leader of the far-right League, called for a continental coalition campaigning for an implicitly anti-foreigner “renaissance of European values” and an end to Europe “run by bureaucrats”, meaning the European commission, France, Germany and the Benelux countries. 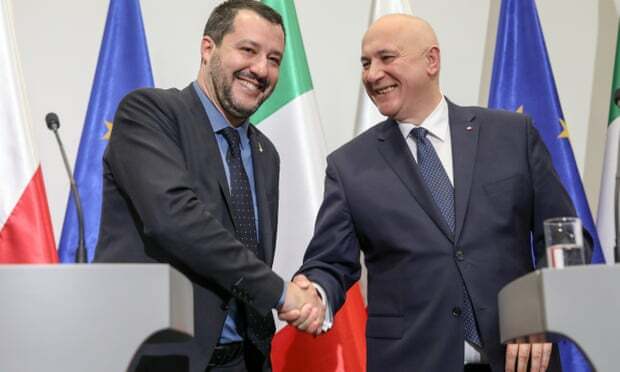 Salvini swiftly obtained the applause and backing of Europe’s foremost anti-immigrant, anti-Muslim Eurosceptic, Viktor Orbán. Hungary’s prime minister had previously cast the May polls as a personality contest between himself and Macron. Now battle lines are expanding and stakes are rising. All of Europe is the prize. Salvini’s confident prediction of a new “European spring” looks, at first glance, to be sinister and overblown. Orbán’s claim that the migration question is the defining issue in European politics and his roadmap for a phased, rightwing takeover of the EU sound like unpleasant pipe-dreams. But is that really all they are? There is a theory, attractive to progressives and liberals for obvious reasons, that Euro-Atlantic populism has peaked, that Trump has overplayed his hand on the wall with Mexico, that the steam has gone out of the Syrian refugee crisis, that the anger and alienation that sparked Brexit and recently boosted the far-right in Sweden, Italy and Spain have dissipated. Dream on. The balance of political power in Europe has shifted from the centre to the extremes, possibly permanently, and mainly to the benefit of the hard right. About one in six western European voters now regularly back populist parties. Economic disparities and wealth gaps yawn ever wider. Across Europe, migration – locally problematic or not – resembles a roadside IED, ever ready to explode without warning. Agree with Orbán or not, migration has become a catch-all Trojan horse issue, encompassing concerns about identity, finite resources, community, culture and sovereignty. It symbolises the perceived failure of established elites to comprehend, let alone solve, the “problem”. It is a potent electoral weapon. When Salvini talks of a rebooted Europe founded on “new blood, new strength, new energy”, there are unmistakable rhetorical echoes of another benighted era of instability, of another crazed demagogue, of another pan-European crisis of leadership and legitimacy. The way things are going, perhaps they should be praying in Brussels for a repeat in May of 2014’s record low turnout. Or perhaps we should all put our hands to our ears and scream. Simon Tisdall is a foreign affairs commentator. He has been a foreign leader writer, foreign editor and US editor for the Guardian.